Malta - a psychosocial magnifying glass: A visual and acoustic presentation of Malta as a metaphor for Europe - images for an internalised history and its parallels today. The panoramic views function as 'inner' spaces – virtual memory spaces. 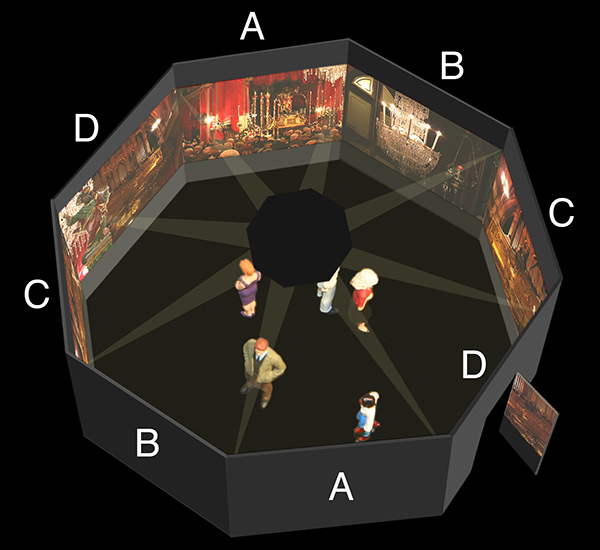 A closed octagon made up of 8 black walls in which the viewers can enter through a door or a curtain. Size of each wall: c. 3m wide and 3m high (at least). Dimensions of octagon: external diameter c. 7.5m, interior c. 7m (at least). Each of the 7 complete walls contains a screen for frontal projection of 280 x 210 cm (at least). The 8th wall with the door or curtain has a film for frontal projection on the interior. Bottom edge of screen: 60 cm above the floor. 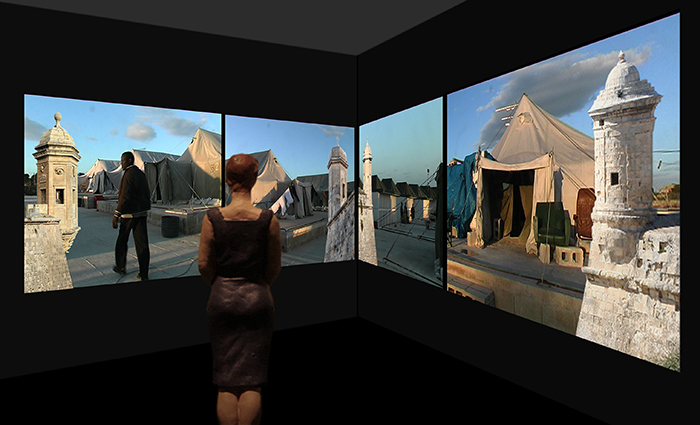 The 8 video channels are a row of 4 different videos, repeated once; together they build fictitious “panoramas”. 8 video projectors, hung beneath the ceiling inside the octagon. Wide-angle lenses are needed in order to provide a full screen projection (3,5m distance between beamer and projection surface). 4 synchronized CF-card media-players (each feeding 2 projectors), connected to the projectors with DVi or VGA cables. 4 loudspeakers (2 x stereo). The images should “crowd in” on the viewers, simultaneously showing perspectives and expressing confinement. Being closed in fits with the life experience and view of the world which Catholicism offers/offered or imposed on its adherents. The viewer experiences something of the situation of the “illegal” immigrant in the reception prisons and within the tight network of controls on Malta and in other places in Europe. Living in Europe, we still feel ourselves to be - in relation to events in other parts of the world - reasonably secure and protected, like being in a defensive castle.